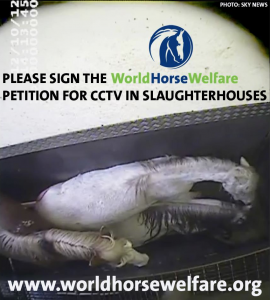 This SKY NEWS article is a must read for anyone who breeds indiscriminately, or passes on older or lame horses – Turner’s Abattoir, Cheshire is where many of these horses end up. The answer is not no slaughterhouses, but more that are regularly and diligently policed by welfare bodies. This is happening because these abattoirs are inundated with more unwanted animals than they can process properly. Indeed, it’s come to our attention that this Cheshire abattoir even exports abroad horses sent to their plant that were thought to be slaughtered in the UK. The film raises so many questions, not least the worry that amongst other illegal practices, horses were possibly subjected to Halal slaughter. The UK needs to wake up, and face the fact that the disgusting and appalling treatment those horses received at the end of their lives will go on until breeding becomes stringently regulated, and export and import laws are tightened up, and ultimately, people take responsibility for their horses once they are no longer useful. The film is not pleasant, but don’t turn away. Watch and be outraged and DO something about it. Please sign the WHW petition below – it’s not a solution, but it is a start. The horses would emphatically NOT have been subject to halal slaughter because horses are outlawed under Muslim food laws, as under the Kosher system. Our information suggests that horses are slaughtered for Halal.